Loving opposites attract, bond, and blend in Sue Beatrice’s powerfully symbolic mixed metal necklace. Opposites don't just attract, they get downright cuddly in Sue Beatrice's powerfully sweet mixed metal necklace. 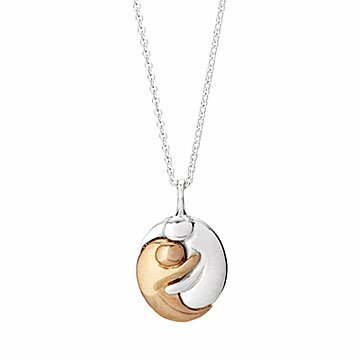 An affectionate pair of intertwined figures, one sterling silver, one bronze, are bonded together in perfect balance. Together, they add up to more than the sum of their parts. Hand polished to a brilliant shine and suspended from a sterling silver chain, the thought-provoking symbol will remind the wearer—and all who stop to admire it—of love's paradox, which creates one from two, while protecting the individuality of each. Handmade in New York. L 3.2” x W 2.3” x H 1.1”, Chain: 18"
My wife wanted a new necklace unique and for everyday where. it was was the perfect item.